For the airport in Kraków, see Kraków John Paul II International Airport. João Paulo II Airport (IATA: PDL, ICAO: LPPD), named after Pope John Paul II, is an international airport located on the island of São Miguel, in the Portuguese archipelago of the Azores. Situated 2 km (1.2 mi) west of the city centre of Ponta Delgada, it is the primary (and busiest) airport in the Azores, as well as the fifth largest infrastructure managed by ANA Aeroportos de Portugal; with the construction of the terminal in 1995, by 2005 the airport served a total of 873,500 passengers. It has scheduled domestic flights to all islands of the Azores, plus Madeira and the mainland, namely (Lisbon, Porto and Faro). João Paulo II Airport also accommodates international flights to and from Europe and North America. The airport is the major hub for the SATA Group of airlines, which includes both inter-island SATA Air Açores and international Azores Airlines, and since April 2015 as a base for Ryanair. The airport was inaugurated on 24 August 1969 by President Admiral Américo Tomás, after its construction was planned six years earlier, in 1963. 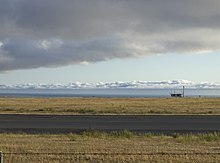 Transferred from Santana, at the time of its opening, the runway was 1,800 metres (5,900 ft) long and was then referred to as the Aeroporto da Nordela, owing to its location at the extreme northwest of Ponta Delgada. It was built in order to serve inter-island connections and the continent, using a single Boeing 737 from the national flag carrier (TAP33). Yet, it was only two years later that first regular flights to Lisbon were initiated. In May 1995, at the inauguration of the airport terminal, the facility received the designation João Paulo II, in honour of the visit of the Pope to the Azores in 1991. "This airport, is part of the integrated history and economic and social development of the Azores, in particular of the Micaelenses, and constitutes an relevant equipment at the service of air transport, not just of the passengers, but also the transport and mail. It is the infrastructure with the largest expression of air traffic in the autonomous region of the Azores, reaching in 2011 935,000 passengers." Along with the airports in Lisbon, Porto, Faro, Flores, Santa Maria, Horta and Beja, the airport's concessions to provide support to civil aviation was conceded to ANA Aeroportos de Portugal on 18 December 1998, under provisions of decree 404/98. With this concession, ANA was also provided to the planning, development and construction of future infrastructures.